Gardening is hard work. It is rewarding, but the task is never over. That’s why we should always remember to give thanks to all the help we get at the orchard. Our wonderful volunteers help keep us going. But our hardest workers are some of our smallest. Without our pollinat ors, we wouldn’t be able to enjoy the bounty from our gardens. We rely on plants to power us, and our plants rely on them. They help keep our flowers, fruits, and vegetables strong. Christine Ranegger came out to the orchard on July 21st to teach us about our six-legged volunteers. Christine is a neighborhood captain with the Puget Sound Beekeepers Association, and her expertise and passion for the bees is clear. I and the other lucky attendees learned a lot. We learned about three different types of bees from our capable instructor. One of the most surprising facts I took away was that bumblebees and honey bees were two entirely different species! The honey bee is the bee most of us think of. Large nests, bee dances, and a painful stinger left in your skin are all hallmarks of the honey bee. Honey bees also have a further range than bumblebees, sometimes traveling two miles away from the hive in search of nectar. While bumblebees create nests and create complex social structures, they don’t have some of the same interesting behaviors and dynamics as honey bees. When a new honey bee queen is born, the old queen peacefully leaves the hive with a set of worker bees. If you ever see a swarm of bees, don’t hesitate to contact your local bee-keeping association or fire department! The bees might find a home with a local beekeeper, instead of in the siding of a home. We also learned about mason bees. These bees prefer solitude, and typically range only a couple of hundred feet from their home base. They like to nest i n blocks with tubular holes in them. The females are usually placed near the back of the hole, while the male cocoons are placed near the front. This strategy allows the males to hatch first and protects the valuable, pollinating female cocoons from hungry woodpeckers! The weather was perfect, and I left inspired to seek out my apian friends the next time I walked past a lavender bush. It didn’t hurt that I was able to walk away with a jar of Christine’s delicious honey! This entry was posted in Orchard Events, Plants, Uncategorized and tagged bumblebee, honey bees, mason bee, pollinators on August 5, 2018 by Max Menchaca. Water Conservation in 2018 – Is It Working? Please visit us this Saturday, 10-noon, for a tour of our new watering system. We will have signage throughout the orchard and we will be anxious to get your ideas about how we can manage water even more efficiently. Our system begins with our three cisterns, which catch 4,000 gallons during winter rains. 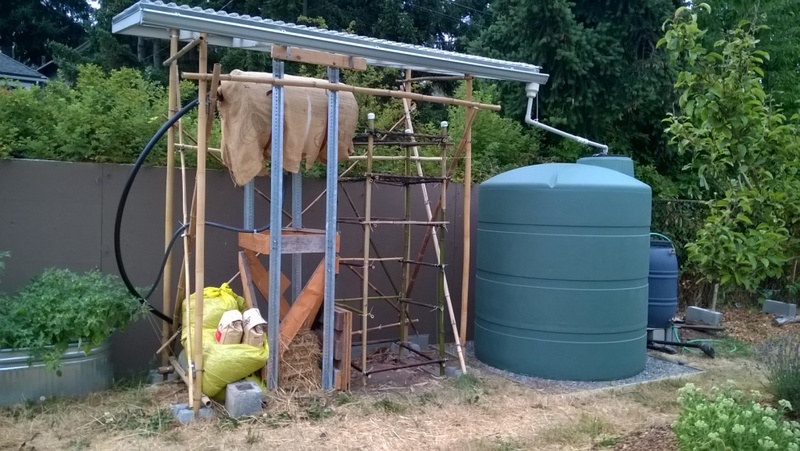 Our human-powered treadle pump pushes water into barrels that are five feet above the garden beds. We have three different gravity-fed drip irrigation systems that do the work of spreading the water from the elevated barrels to the plants. We are also using 1/4″ poly line siphoned from 5-gallon buckets for trees, clay ollas matched with perennial and annual vegetables, perforated pipe (bamboo) for our vertical garden and for edible shrubs. 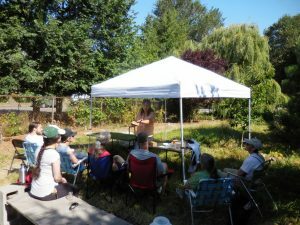 Come, review our watering log, our water measuring tools, and find out about mistakes we made, needed improvements, and how we managed to keep clam during the two weeks with temperatures near 90 degrees. ● Is rainwater running off the polycarbonate roof better or worse than tap water? ● Would you stand under the water barrels that weigh 400 pounds? ● Which drip irrigation system can best usher water to specific plants? ● Do the drip systems allow for cleaning and storage in winter? ● How does the rate of water discharge through a drip system affect the percolation depth? ● Can perforated pipes be installed subsequent to planting? ● What are the factors that influence how quickly water will seep from the olla? ● Does cistern water contain bacteria and algae and, if so, will it adversely affect plants? ● What’s the difference between soil moisture based irrigation and crop demand irrigation (evapotranspiration)? ● Are some crops better at using water than others? More questions? We will soon have a page on our website dedicated to the details of this project. In the meantime, enjoy the marvelous brochure produced by Dylan and Luke (Spellebee Space) on our Library page – Documents of Interest (under photos). Stay tuned for a celebration if we make it through the summer without turning on City water. Perhaps a water balloon fight! 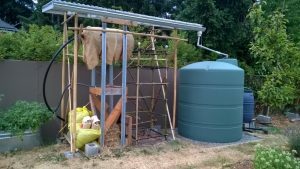 This entry was posted in Construction, Plants, Uncategorized and tagged evapotranspiration, gravity-fed drip irrigation, olla, perforated pipe, Water conservation on August 2, 2018 by Ruth.